Tout en profitant des environs comme le rafting, le kayak, la randonnée, le golf ou la pêche, admirez la vue majestueuse sur la montagne du parc national des Glaciers. Détendez-vous dans le lodge le plus moderne de West Glacier, qui apporte une touche de rustique Montana à une ambiance élégante. Situé à moins de 1,6 km de West Glacier, l'entrée ouest du parc national des Glaciers. This is a very nice property. Because it’s so close to Glacier and on the main thoroughfare getting into Glacier there is road noise as the property is 30 paces or so from Highway 2. Nothing the owners can do about it but every morning we heard the train roll by at 4:27 am, three whistles and all. There were also sporadic trains in the late evening. Two weeks prior to our trip we called inquiring about the fire and smoke situation in the Park. We were advised that the fires were still active but that we could avoid them by going to the east side of the Park. During our stay there were significant fires on the west side of Glacier. This caused us to drive the 50 to 60 miles one way to the east side of the Park to go hiking as the Going to the Sun Road was not fully open. As a result we left the property a day early as the three plus hour round trip became too much of a time drag. While we were not provided any type of refund (which we understood from the outset) we were offered a nights credit if we or any of our friends wanted to use the unit over the next year. So appreiative of Ron and Trudi...Great hosts, and truest concerned my family had a great experience. We came in on the Amtrack which was late, obviously, and there are no taxis in the area unless previously arranged. Hertz has cars onsite, but again need to be prearranged. The cabin is just a mile away, and Ron went out of his way to make us feel safe and get us down the road to the Cabin. Ron also made sure we new places to visit, and where to grab groceries. House was super clean and the log cabin construction made us feel a part of the National Park. Location was great too. Can walk to the welcome center, rafting company, food etc. All within a mile. We drove...but we were whimsy ;). 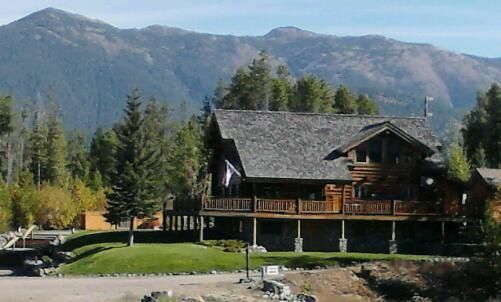 Happy to hear you and your family enjoyed the lodge and the close proximity to West Glacier and Glacier Park. Spacious and very nice! Excellent accommodation! Trudi was very responsive prior to our trip and was very accommodating of changes in our plans when a wildfire impacted our access to the park. Ron was very welcoming when we arrived and my two sons loved the mountain-size chocolate chip cookies that were waiting for us! The unit is on the upper portion of the building, so with warm weather during the day open windows at night were a must, but the property comes with two fans so the temperature was very comfortable. With the open windows, train whistles at night were an issue for me the first night but after a day of hiking on subsequent nights, I did not hear a single whistle! Train whistles are going to be an issue for some on any property located on Hwy 2; no getting around it. The location was excellent, close to great restaurants (highly recommend the Sunflower Cafe for breakfast or lunch) and the west park entrance. This property is an excellent value with top-notch management! The unit itself is cute and perfect for two. Except, there is no AC. This is important for a couple reasons: This is on the main highway and you will hear road noise all day and night. It is located only a couple hundred yards from the railroad tracks, and the trains blow their whistles at each road crossing; 5 times each time they pass. The trains run day and night. You will be blasted out of bed every 90 minutes by the trains when you are sleeping. Other reviews that say the trains didn't bother them--they must have had great sleeping pills! Add to it a record heat wave while we visited and smoke from wildfires (neither their fault), it was miserable. You cannot sleep with the windows open due to the noise. You cannot sleep with the windows closed due to the heat. AC would have made the visit tolerable, because you would have been able to shut out the noise and remained comfortable. We ended up cutting out vacation short because we were so miserable. This may be more of a statement about West Glacier as a whole rather than just this house, but i cannot recommend it, nor would I return. If you rent, bring earplugs and sleeping pills. You will need them. Sorry to hear you had an unpleasant experience in West Glacier. It is our goal that guests would enjoy the beauty of a Glacier, the lodge and leave refreshed. Sadly, that was not your experience. The log lodge does not have AC as it is seldom needed. Heaters and fireplaces are needed for most of the year. There were a few days of unusually warm weather and unfortunately the visit was during that time. As I write, August 26th, 20 days later, it is raining with winter weather advisory and snow in higher elevation. The highway and train go through West Glacier and pass by the area businesses, including the lodge. It is the road all guests drive to get into Glacier. Most guests are thankful for the close proximity to Glacier Park. Sadly, there was a lightening fire in Glacier. Weather, roads, trains and lightening fires, we can not control but providing a “cute and prefect” rental unit is what we work diligently to provide for our all our guests. Property manager was very nice and attentive. Unit was extremely clean. Very nice inside. Super quiet. Would recommend. Happy to hear you enjoyed your stay!😊. Will definitely pass the cleaning compliment on to the cleaning team, they work hard and value what they do for our guests. Nice home away from home! Loved our stay here. Good views of the mountains. Happy to hear you enjoyed the mountains of Glacier and staying at the lodge! Nous sommes idéalement situés à 1 mile de l'entrée ouest du parc national Glacier. Avec dans le village de West Glacier, on peut profiter de 18 trous de golf, rafting, pêcher à la mouche, magasin, nager, faire du canoë et randonnée. Nous sommes situés à 20 minutes de Bigfork où vous pourrez profiter du théâtre en direct, restaurants haut de gamme et des boutiques. 20 minutes de Big Mountain à Whitefish où vous pourrez profiter de balades en gondole, la randonnée et le vélo tout donnant sur les montagnes de Glacier et au Canada.